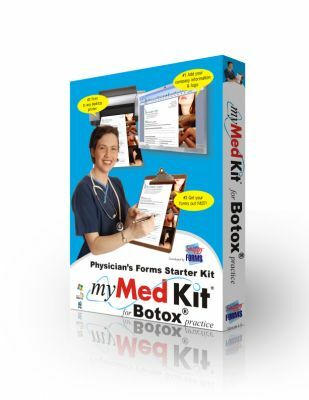 myMed Kit for Botox® provides you with 28 (Some forms may contain 2 and 3 pages), state-specific necessary forms to start your Botox practice or to replace your old, outdated existing practice forms. Forms have been developed under the direction of cosmetic practice physicians, medical staff, medical attorneys and form developers to provide you with aesthetically designed, legal forms that are pleasing and relaxing to your clients when requesting their signature on legal forms, preventing client confusion and disappointment. Doctors wanting to immediately add Botox to their list of services will find myMed Kit for Botox® an indispensable forms kit offering minimal expense and saving you valuable time and money. Existing cosmetic practice can do away with old, outdated legal-looking and scarry forms and update their office forms and customer practice perception without the added expense of form design and reprint. Tip: Many physicians overlook the value of having professional office forms that accurately reflects their brand image, many times you see them copy the same forms over and over again until they are hardly visible to read and do reflect a careless image on your work methods, yet this small piece of paper can be an important part of your collateral package. It's often the first item new patients receive from your staff, so it's your first opportunity to make a strong, positive impression on them. 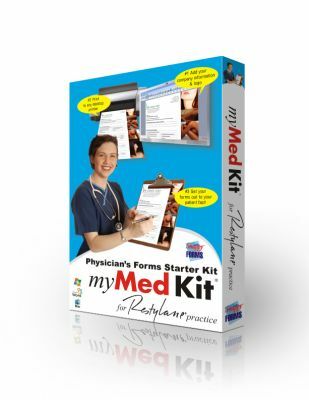 myMed Kit for Restylane® Practice provides you with 28 (Some forms may contain 2 and 3 pages), state-specific, necessary forms to start your Restylane practice or can be used to replace your old, outdated and faded existing practice forms. Forms have been developed under the direction of cosmetic practice physicians, medical staff, medical attorneys and form developers to provide you with aesthetically designed, legal forms that are pleasing and relaxing to your clients when requesting their signature on legal forms, preventing client confusion and disappointment. Doctors wanting to immediately add Restylane to their list of services will find myMed Kit for Restylane® an indispensable forms tool kit offering a wide array of forms at minimal expense, saving you valuable time and money. Existing cosmetic practice can do away with old, faded and outdated legal-looking and scarry forms and update their office forms and client and patient perception of your office setting without the added expense of form design and reprint.